Leonard Nimoy's latest photographic project makes the actor an unexpected name among the celebrities celebrating the fuller-bodied woman. The Star Trek actor has published a book called the Full Body Project, featuring his photos of members of San Francisco’s Fat Bottom Review group. The book grew out of Nimoy’s photographs of obese women, which have been exhibited in galleries across the US. Queen Latifah endorses the Jenny Craig diet, but simply stresses the value of being “a size healthier”. Jennifer Love Hewitt has begun working with girls about self-image after ugly media attacks on her weight. But what made Nimoy explore the new world of over-size beauty? 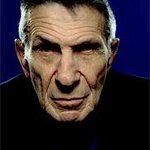 A large woman approached Nimoy about his photographs, citing that there were no women who looked like her in his work. In an interview with NPR, Nimoy admits his first full figure shoot made him uncomfortable. He began to understand that his reaction was a reflection of this culture’s perpective of body type.